CRC Handbook of Free Radicals and Antioxidants ,vol 1 (1989), p209-221. Free radical ( "Redox:" ) signaling: Conference on Active Oxygen and Medicine, Honolulu, March,(1979). Abstract . Indirect evidence suggests that free radicals and excited-state species play a key role in both normal biological function and in the pathogenesis of certain human diseases. For example, generation of activated species by inflammatory cells is a major microbiocidal mechanism and may also mediate important components of the inflammatory response. Activated processes may also be key components in the toxicity of many drugs, in aging, and in carcinogenesis. They may also figure in the etiology of certain ocular, neurological, and psychiatric diseases. The evidence for a role for electronically activated species in human disease has long been prevalent. For example, Darwin repeats the well-known observation that white, blue-eyed cats are usually deaf. Similarly, the relationship between pigmentary abnormalities and human deafness (for example, in Waardenberg's or Usher's syndromes) is commonplace in audiology(4). Likewise, physicians have long recognized the association between radical-generating metals such as copper or iron and fibrotic changes, e.g., interocular fibrosis in vitreous chalcosis and liver cirrhosis in Wilson's disease and Hemochromatosis. Further, free radicals and other activated species are so difficult to measure under biological conditions that the evidence for their role in any biological process - much less a human disease state - is normally indirect and circumstantial. This flawed scientific basis often results in heated controversy over methodology, results, and conclusions. Even less should be expected of the clinical evidence. Nonetheless, there is significant circumstantial evidence that active oxygen (Figures 1 and 2) is involved in some of the most fundamental mechanisms in pathogenesis and in the etiology of many human diseases. FIGURE 1. The active oxygen system. Molecular oxygen is reduced to water in four single-electron steps. Reduction of nonradical forms of oxygen is a " forbidden " process and thus usually involves spin-orbit coupling by a heavy metal or a halide or excitation to singlet state. An example is Fenton's reaction, the reduction of peroxide to water and hydroxyl radical by ferrous iron. Hydroxyl radical is one of the most powerful oxidizing agents known. Simply put, reducing agents act as prooxidants by reducing nonradical forms of oxygen to radical forms, usually with heavy atom involvement. Similarly, they can act as antioxidants by reducing radical forms of oxygen, by terminating radical chain reactions, or by, for example, reducing hydroperoxides. This dual property can be of great significance. For example, in humans uric acid is probably the primary extracellular antioxidant. On the other hand, a Fenton-type reaction of phagocytized urate with granulocyte-produced peroxide may contribute to the etiology of gout. FIGURE 2. Neuromelanin. A: Dopaminergic pigmented neurons in pars compactaof substantia nigraand B: Noradrenergic pigmented neurons from locus ceruleus. ( Autopsies by the author). Most, if not all, central catecholaminergic neurons contain a stable free radical, melanin. 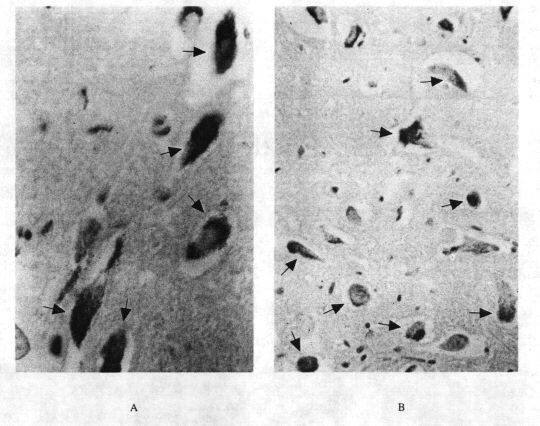 Specific dying-off of pigmented neurons in the substantia nigrais the apparent cause of Parkinson's disease. Dopaminergic neurons may also be concerned in schizophrenia and in various movement disorders ( e.g., choreoathetosis in the Lesch-Nyhan syndrome ). Noradrenergic neurons may figure in endogenous depression and Altzheimer dementia. The function, if any, of melanin in such neurons is unknown but it may be related to its antioxidant and semiconductor properties. G. C. Cotzias on neuromelanins: " The neuromelanin granule may be the secret key to the understanding of Parkinsonism. I don't believe God put the melanin granule in the central nervous system for nothing. It must be doing something. Something big... "
Later note: Go here and here for examples of the drop-out of melanin-containing neurons in Parkinson's disease. Also, melanin-bound iron, increases in Parkinsonism-- vis, the parkinsonian-like symptomology occasionally found in hemochromatosis. Go here for an example of the antioxidant properties of melanin. The evidence for a role in disease is of several types. For example, many human diseases present with increased production of activated species or with increased levels of radical-generating substances. Examples include granulocyte activation in inflammation or copper in Wilson's disease. Additionally, the progression of many diseases may be modulated pharmacologically by ectopically administered superoxide dismutase (SOD), catalase, or free radical scavengers. Finally, many such diseases are also associated with one or more characteristic symptoms (Table 1). As summarized in Figure 3, granulocytes and other phagocytic cells possess a membrane NADPH oxidase, which-takes reducing equivalents from the hexose monophosphate shunt and transfers these to molecular oxygen to produce superoxide and other active oxygen species. A further myeloperoxidase converts peroxide produced in this system to microbiocidal products, probably including hypochlorite (2). Production of activated products by this system probably plays a key role in cell-mediated immunity and microbiocidal activity. There is evidence for similar systems in T-lymphocytes,(15) platelets,(6) and mucus. (17) An NADPH oxidase of noninflammatory cells may have a role in mediating cyclic nucleotide metabolism ( 18-20 ). FIGURE 3. Role of active oxygen species in inflammation. Inflammatory cells ( granulocytes, macrophages, some T-lymphocytes, etc. ) produce active species of oxygen as part of the microbiocida1/citocidal system. In turn, active oxygen species can modulate specific elements of the inflammatory response in vitro. Examples include protein immunomodulator substances such as granulocyte migratory factors, prostaglandins, cyclic nucleotides, as well as formed elements such as platelets. Which, if any, of these are relevant to the in vivosituation is unknown. Biological systems protect themselves against the damaging effects of activated species by several means (21-22). These include free radical scavengers and chain reaction terminators: enzymes such as SOD, catalase, and the glutathione peroxidase system; and " solid-state " defenses such as the melanins. Chemical antioxidants act by donating an electron to a free radical and converting it to a nonradical form. Likewise, such reducing compounds can terminate radical chain reactions and reduce hydroperoxides and epoxides to less reactive derivatives. However, chemical antioxidant defense is a double-edged sword. When an antioxidant scavenges a free radical, its own free radical is formed. Many antioxidants can act as pro-oxidants by, for example, reducing nonradical forms of oxygen to their radical derivatives, particularly if redox cycling occurs. The exact mix of pro- and antioxidant properties of a reducing compound is a complex interaction involving pH, relative reactivities of radical derivatives, availability of metal catalysts, and so forth. For example, the anti- or pro-oxidant properties of sulfhydryl compounds depend upon pH (29-31), those of beta carotene upon oxygen concentration (69). Likewise, uric acid, probably a significant antioxidantin higher primates (32-36) participates in a Fenton-type reaction with peroxide(35, a property which may be important in the etiology of gouty inflammatory disease. Similarly, stable radical formers, such as the melanins or the nitroxide spin labels, scavenge odd electrons to form stable radical species, thus terminating radical chain reactions. Interestingly, minoxidil, noteworthy because of its ability to stimulate hair growth and reverse pattern balding, is a nitroxide closely analogous to commonly used spin labeling compounds. Later Note : Go here for a discussion of how free radicals may modulate hair growth. This is another manifestation of free radical ( " redox " ) signaling. Also, nitroxide spin labels such as TEMPOL are potent SOD-mimetics. Both spin traps and spin labels have significant potential drug applications for most of the diseases considered in this review. Go here for more on this. Enzymatic defenses against active species include SODases, catalases, and the glutathione reductase/peroxidase system. While there have been some thoughtful questions raised, SOD appears to be one of the most specific enzymes known. Inhibition of a biological process by SOD is often taken as putative evidence for a role for superoxide in that process. However, some of the actions of SOD appear to be due to peroxide production rather than superoxide destruction (4). Most recent work in free radical defense centers on chemical antioxidants and enzymatic defenses. However, a third class of mechanism, solid-state defense, may be at least as important, particularly with respect to human disease. In solid-state defense, a macromolecule binds a radical-generating compound, deexcites an excited-state species, or quenches a free radical. In many ways the internal action of SOD matches this definition. However, the most important solid-state defense is probably the black pigment melanin. Melanin is also important because it is the only biological polymer which is a stable free radical and was the first free radical established in biological systems. In the same manner, a visible pigmentary response often occurs in the presence of a radical-dependent process, be it a dermal inflammatory process, UV light, or the chronic presence of a pro-oxidant such as iron in hemochromatosis. This dermal pigmentary response is the only part of the defensive reaction to active species which is a clinically apparent symptom. Thus, it forms a part of the radical-dependent symptom complex (Table 1) and represents a visible outward sign of an otherwise invisible active process. While chemically inert, melanin is a very active " amorphous semiconductor ". In amorphous semiconductors, photon or electronic energy in the form of motions of electrons is very strongly coupled to molecular vibrations or " phonons ". Heat is one manifestation of phonon energy, while sound vibrations are another. That is, in the melanins electronic or excited-state energy readily exchanges with vibrational energy in the form of heat or sound. Such seemingly esoteric considerations may explain much of the physical properties and biological functions of the melanins (35-41). For example, the melanins are black, photoprotective, and nonfluorescent because most photon energy ( e.g., from light or chemically produced excited-state species ) absorbed by them readily converts into heat ( 36~37 ). This likely explains the presence of melanins in such energy-transducing areas as the skin, retina, and inner ear. Conversely, rate limitations for such conversions mean that the melanins may themselves be toxic to the cells which contain them by electronically-activated mechanisms (4-9). This may be important in the etiology of such disorders as Parkinsonism, senile macular degeneration, and senile deafness (4,9-27,41 ). Likewise, the ability of melanins to readily convert vibrational energy in the form of sound into electronic energy means that they are by far the best sound-absorbing materials known (38). This may account for their presence ( as protective devices ? ) in the inner ear (4,9-27,41). It is also relevant to the well-known association between pigmentary abnormalities or the presence of melanin-binding drugs in deafness ( e.g., Waardenburg's syndrome and aminoglucoside ototoxicity ), as well as the association of deafness with pigmentary retinopathies in Usher's syndrome and chloroquine toxicity. The melanins also have some rather exotic electronic properties. For example, they can act as threshold switches and can store electrical energy like batteries( 39 ). Such properties may explain the presence of melanins in electrically active tissues such as the substantia nigra, where it may play a role, for example, in Parkinson's disease ( Figure 2 ). Later note : By nearly a decade, melanin was the first organic semiconductor used in an " active " electronic device ( a bistable switch), where an electric field controls current flow. Bistable switches are the basic unit of your computer. Since the "on" state of this switch has almost metallic electrical conductivity, melanin is also the first organic compound shown to have a high-conductivity state. Melanins are polyacetylenes and vice versa. Much to our surprise, the later discovery of high conductivity produced by chemical means in another polyacetylene ( i.e., another "melanin" ) won the 2000 Nobel Prize in Chemistry. This is like recognizing simple semiconductivity in silicon, while ignoring its previous use in a transistor. Interestingly, nearly all organic semiconductor devices since have technically used "melanin" as their active element. Melanin also forms stable free radicals, quenches excited states, and binds radical-forming agents such as transition-series metals. All likely contribute to its putative role in antioxidant defense. On the other hand, the ability of melanin to bind toxic radical-generating agents may sometimes be detrimental, as in chloroquine retinopathy and aminoglycoside ototoxicity (41). Finally, melanin can function as an efficient S0Dase and may retain this function in pigmented organs. Thus, the melanins ( which can form abiologically ) may be the oldest evolved system for defense against oxygen radicals, rather than SOD/catalase. Free radicals are produced by environmental causes such as light or ionizing radiation. However, three physiological processes can result in extraordinarily high levels of radical species. These include the mixed-function oxidase system of endoplasmic reticulum, the NADPH oxidase system of inflammatory cells, and the presence of high levels of autoxidation-mediating charge-transfer agents. Production of activated species by such mechanisms can exceed the capacity of local protective mechanisms and produce tissue injury. Inflammatory cells produce active species of oxygen in antimicrobial defense (1,2). While such species may directly damage surrounding tissues, their major secondary role may be to mediate important components of the inflammatory response. For example, Figure 3 lists some of the inflammatory immunomodulators reported to be affected in vitro by one or more components of the active oxygen system. Inflammation in the general sense comprises the whole of the systemic response to injury, so many of these same processes may also occur in ischemic injury, for example. While circumstantial, the list includes most of the major components of the inflammatory response and grows daily. Similarly, antioxidants, SOD, and catalase have significant anti-inflammatory properties (3-5). For example, Orgotein, the pharmaceutical preparation of SOD, is used in veterinary medicine. It is reported to be both safe and effective in the treatment of various inflammatory and degenerative lesions in man ( 3-4 ). The action of many other antiinflamatory drugs may also involve interactions with the active oxygen system.4 Such agents may act by interfering with the action of phagocyte-produced active oxygen species on one or more of the systems outlined in Figure 3. The role of active species in the inflammatory response may also explain the dermal pigmentary response in inflammation (4). Active oxygen species may also have a role in endotoxin shock, burn-induced plasma volume loss, and even in atherosclerosis - e.g., the atherosclerotic lesions in homocystinuria. Likewise, radical mechanisms may play a role in stroke, cerebral edema, and spinal cord injury, as well as ischemic injury ( 42 ). Radically mediated drug toxicity usually occurs by one or both of two main mechanisms These are ( 1 ) production of activated drug metabolites ( chiefly by the microsomal oxidation system ) and ( 2 ) production of active species of oxygen, a process often involving redex cycling. Examples include hepatotoxins such as acetaminophen, halothane, and carbon tetrachloride and nephrotoxins such as the nitrofurantoins, cis-platinum, and the aminoglycoside antibiotics. Both the action and toxicity of important antitumor agents such as adriamycin, cis-platinum, and bleomycin seem to depend upon production of active oxygen species (4~45 ) and often involves redox cycling. The differential toxicity of such agents to tumor cells may depend upon the relative paucity of antioxidant defense mechanisms in malignant cells, while a significant part of their organ toxicity may be a consequence of the paucity of antioxidant defenses in the extracellular space (4). A variety of active oxygen-generating agents can produce fibrotic changes. Examples include oxygen itself, paraquat, nitrofurantoins, and bleomycin, which produce pulmonary fibrosis. Radical-generating agents such as iron and copper are also associated with liver fibrosis ( cirrhosis ) and fibrotic changes in other organs such as the heart. The induction of vitreous scarring by interocular iron or copper is also well known, as is the association of homocystinuria with fibrotic lesions of the arteries. Figure 4A shows human pulmonary fibrosis produced by exposure to high levels of oxygen, while 4B shows fibrosis produced by nitrofurantoin. Pulmonary fibrosis is also seen in such diseases as asbestosis and cystic fibrosis, where it may be a consequence of the production of active species by inflammatory cells and perhaps mucus. 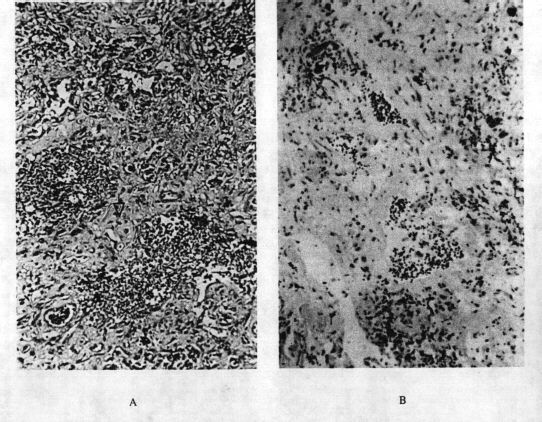 As an illustration of the commoness of radically-induced pulmonary fibrosis to nonclinicians: both pictures are from randomly assigned autopsy cases done by the author on a general autopsy service over a 10-week period during which 27 other autopsies were done - two others of these were bronchopulmonary dysplasia ( BPD ). The clinical importance of radical damage to lung becomes even more impressive when Adult Respiratory Distress Syndrome ( ARDS ) and its permutations, which are likely mediated by production of active oxygen species by inflammatory cells, are included. Radical production by ectopic agents may induce pathological fibrosis because it minics the nonpathogenic activity of a normal modulator system linking production of active oxygen species by inflammatory cells with scar formation as part of the healing process. FIGURE 4. "Generic" pulmonary fibrosis. A: Interstitial pulmonary fibrosis ( BPD ) secondary to neonatal oxygen exposure in a 6-month-old infant girl. BPD is a common sequela in premature infants given oxygen ( magnification x 200) and B: interstitial fibrosis associated with chronic use of nitrofurantoin for urinary tract infection in a 62-year-old woman ( magnification 400X ). In both cases, normal lung is almost completely displaced by interalveolar (interstitial) fibrosis ( scarring ). The interstitial space is normally very thin. Other oxygen radical-generating agents such as paraquat and bleomycin produce a similar picture. ARDS ( or " shock lung " ) is another pulmonary disease apparently related to inflammatory cell production of active oxygen species and probably oxygen. Histologically, ARDS closely resembles the early stages of oxygen or paraquat poisoning. Both autopsies were performed by the author. The third major mechanism for endogenous generation of activated species is by autoxidation -catalyzing charge-transfer agents such as copper, iron, or manganese. This work was pioneered by Cotzias and co-workers for chronic manganism. Significantly, the concept of a metal/neuromelanin/free radical interaction was part of the basis of the development 0f levodopa therapy for Parkinson's disease. The quote in the caption for Figure 2 is appropriate. To summarize this area: chronic, elevated systemic levels of autoxidation-catalyzing. melanin-binding charge-transfer agents are associated with combinations of characteristic symptoms. These include psychosis, movement disorders ( dyskinesias ), deafness, pigmentary abnormalities, inflammatory/fibrotic processes, and arthritis. Significantly, renal tubular lesions, cardiomyopathies, and diabetes can be associated with many such agents; another name for hemochromatosis is " bronze diabetes ", while many diabetogenic agents are notorious radical producers. Likewise, cardiomyopathy with consequent heart failure is a common cause of death in the iron storage diseases. Such considerations may also explain the correlation between nephrotoxicity and ototoxicity with drugs such as the aminoglycoside antibiotics and cis-platinum. Table 1lists some such diseases, the associated agents, and the characteristic symptomology. The correlation of radical-generating agents with fibrotic and arthritic symptomology is readily explicable in terms of the apparent role of such species in the inflammatory process, as outlined in Figure 3. Similar ( often extracellular ? ) mechanisms may hold for cardiomyopathy, renal tubular impairment, and diabetes. However, the correlation of such agents with neuropsychiatric symptoms, while long known, is somewhat harder to explain. Some interaction with melanin in the inner ear and midbrain is possible. Such agents bind to melanin by charge-transfer mechanisms for much the same reason that they catalyze radical oxidations. Several reviews list a few of the ways in which active processes might interact with neurological diseases. These include interactions with neurotransmitters, their effector systems, or autoxidation. Other mechanistic possibilities include relatively nonspecific damage to neural tissues and interactions with neuro- or inner-ear melanin (4). Again, it is presently impossible to select from among such possibilities. As in the case of inflammation, it is likely that specific mediator processes are particularly significant. Perhaps activated processes play a mediator role in nervous function similar to that which they apparently play in the inflammatory process. That is, active species may be neurotransmitters in the same sense that they appear to be cellular and immunomodulators. In this, they join a long list of agents ( e.g., monoamines, cyclic nucleotides, and the prostaglandins ) with such multiple roles. Later note: The concept that free radicals, etc. have a general messenger function is now known as Free Radical ( or Redox ) Signalling. For purposes of illustration, two of the disease complexes listed in Table 1 are briefly discussed here. These are diseases of purine metabolism such as gout and the Lesch-Nyhan syndrome, and diseases of iron metabolism such as hemochromatosis. The archetypical free radical disease, manganism, is reviewed elsewhere (54). 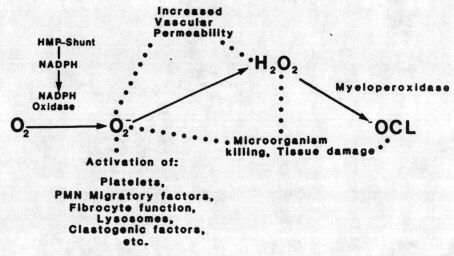 My introduction to this area in the late 1960s was the accidental discovery ( during studies on the Lesch-Nyhan syndrome ) that uric acid and other purines can mediate a Fenton-type reaction with peroxide, as well as act as antioxidants and cofactors for parotid adrenalin oxidase (3). Purines also catalyze the autoxidation of epinephrine under certain conditions. The latter may involve a Fenton-type reaction with peroxide produced by adrenaline autoxidation (72). The validity of such hypotheses is supported by their ability to predict new data and explain old observations. For example, hyperuricemic syndromes present variably with most of the symptomology associated with the chronic presence of charge-transfer agents. Likewise, Lowrey (6) reports a hyperuricemic syndrome in Dalmatian dogs which is associated with deafness and " bronzing " and even responds to SOD treatment - three seemingly unrelated findings, all predictable and explicable in terms of activated etiological mechanisms. An obvious corollary is that hyperuricemic syndromes in man might be associated with pigmentary abnormalities, although this is not as yet reported. Subsequently, Rolfe (55) suggested that the substitution of urate for ascorbate might explain the high relative resistance of man to ascorbate depletion. Many workers have noted the antioxidant/reducing properties of urate in relation to its physiological function (4~34). For example, 10 years after our initial publication(32), Ames and co-workers rediscovered the possible relationship between urate and ascorbate in primate evolution during studies on the antioxidant properties of uric acid (33). Like the melanins, urate may also act as an antioxidant by binding transition-series metals such as iron and is apparently a better antioxidant and much poorer pro-oxidant than ascorbate (70). There is even good evidence that urate may be related to primate longevity through its antioxidant properties (34). We also used activated mechanisms to explain the neurological symptoms of the Lesch-Nyhan syndrome and the evolutionary role of urate years before evidence emerged that they are also involved in inflammatory/arthritic diseases. It now seems that similar processes may be responsible for gouty inflammatory disease (4,57). Again, there are many possible mechanisms by which purines could mediate inflammatory processes. For example, phagocytized urate likely mediates Fenton-type reactions with granulocyte-produced peroxide. Binding of iron, the classic mediator of Fenton's reaction, could facilitate (or inhibit?) such processes. This could explain granulocyte lysis following urate crystal ingestion - a primary pathogenic process in gout. Similarly, purines can modulate inflammatory cell function by various other activated ( ? ) mechanisms (4). Thus, both the physiological and evolutionary roles of urate are readily explained by its antioxidant/reducing properties. On the other hand, the pathogenesis of hyperuricemic syndromes may involve its pro-oxidant properties. This illustrates the often paradoxical problems inherent in assigning a role for radical mechanisms in human disease. For example, the well-established association between high urate levels and atherosclerosis could be a protective reaction ( antioxidant ) or a primary cause ( pro-oxidant ). Iron salts are the classic mediators of free radical processes. As Table 1 indicates, hemochromatosis and other iron storage diseases are but two examples of the association of chronic elevated levels of charge-transfer agents with characteristic symptomology. Significantly, hemochromatosis is variably associated with all six of these signs. The iron storage diseases demonstrate the power and significance of recent discoveries in free radical pathogenesis, since -- as with purinergic syndromes -- most of the diverse symptoms of this class of diseases are potentially explicable in terms of activated mechanisms. For a good review of the pathophysiology of Parkinson's Disease, Go Here . Electronically-activated mechanisms may be involved in many of the most basic pathogenic mechanisms, some of which are listed in Figure 3. In fact, active species seem to be so involved in the ultimate fundamental common pathway(s) of tissue degeneration that the expression " free radical pathogenesis " is perhaps redundant. A free radical etiology of disease ultimately involves free radical involvement in symptomology, for which there is abundant, if circumstantial, evidence. Nonetheless, existing protective mechanisms are adequate enough that active species can be used for certain normal physiological processes. Almost certainly, these include antimicrobial defense and xenobiotic metabolism. Active species also probably act as mediator substances in the inflammatory process and perhaps even as neuromodulators. It follows that acute radical pathogenesis normally occurs under circumstances of extraordinary radical flux. Such conditions include inflammation, radiation, high oxygen tension, and xenobiotic metabolism. Similarly, specific common symptomology is associated with extraordinary levels of potentially autoxidation-mediating, melanin-binding charge-transfer agents such as iron or urate ( Table 1 ). In particular, as Figure 3 outlines, production of active species is a likely primary event in the nonspecific tissue response to injury ( inflammation ). This further confounds our already tenuous ability to assign a role for active species in specific pathogenesis. For example, is the protective effect of SOD and/or catalase against radiation or antitumor agent toxicity due to inhibition of the primary injury or to inhibition of the systemic response to that injury ? Another cogent example of the potential pitfalls of circumstantial evidence: veterinarians often use Palosein®, the veterinary form of SOD, to ameliorate injury in animals struck by automobiles. Obviously, this does not mean that motor vehicles produce primary injury by free radical mechanisms. On the other hand, active mechanisms are a powerful tool for explaining normal and disease processes. It has already been noted how their application to disorders of purine metabolism has evolved -- used first to explain the neurological features of a very rare disease, then to explain the unique physiological and evolutionary role of uric acid in primates, and finally to explain the pathogenesis of purine-induced inflammatory disease in both man and Dalmatian dogs. Also, there are those intriguing hints listed in the text and the associations listed in Table 1, some doubtless fortuitous. If, as seems reasonably well established, active species act as immunomodulators, why not also neuromodulators ? Thus, psychosis, dyskinesia, pigmentary abnormalities, deafness, and inflammatory/fibrotic syndromes may show similar etiologies. This has important therapeutic consequences, because it may be possible to control some radically mediated processes pharmacologically. Later note: For examples using nitrone and nitroxide spin traps and spin labels to treat human diseases, see stroke . I hold the primary patents. One nitrone spin trap, "Cerovive", AstraZeneca's registered trademark for disulfonyl-PBN or " NXY-059 ", is currently in Phase-3 clinical trials for ischaemic injury in stroke. diffuse alveolar damage stroke reperfusion homocysteine injury fenton reaction cytochrome c nitric oxide neuromelanin phenylbutylnitrone pbn skin myocardia infarction mitochondria catalase ards glutathione peroxidase transmission nkbeta nxy-o59 copper antiaging iron inos cnos neurotransmission. No inner ear lung platelet hair interstitial ards dad pbn edrf pulmonary edema asbestosis asbestos cardiac atherosclerosis heart homocystinuria active oxygen autoxidation autooxidation. deaf deafness melanoma pigment cell reperfusion injury neurological prostaglandin superoxide multinfarct redox cellular signaling dementia atherosclerosis myocardial infarction stroke mi mitochondria dismutase sod superoxide paraquat hydrogen peroxide hydroxy radical reactive ozygen species ros etiology copper transition series metal redox cell signaling cytokine nkbeta amorphous semiconductor organic threshold switching electronic regrowth alopecia hair loss properties antioxidant proxidant oxidant oxidation reduction. Cancer altzheimer's beta amyloid nos cnos inos disease senile dementia pbn tempol tempo drug dmpo nxy-059 nitrone nitroxide drug treatment polyacetylene human. diabetes proxidant vitamin c nitrosative stress ascorbate vitamin e deafness deaf nephrotoxic phenothiazine pigmentary abnormalities albino cell signaling ototoxic redox tubular necrosis gentamycin tobramycin signalling aminoglycoside cis-platinum tobramycin gentamycin adriamycin bleomycin messenger uric acid urate hemochromotosis proxidant iron manganese iodide dalmatian hyperuricemia ataxia dyskinesia psychosis cytokine homocysteine heart cardiovascular. Sod mimetic dementia musculoskeletal vascular stria vascularis parkinson. Locus caeruleus substantia nigra midbrain basil heart disease arteriosclerosis ganglia locus ceruleus pigmented nitric oxide nitrosation stroke nxy-059 nitrone stroke reperfusion injury nitric oxide myocardial infarction mitochondria pathogenesis free radical redox cellular signalling schizophrenia ataxia.